Who Is This Guy? Jesús Malverde, Patron Saint of the Drug Lords | ¡VidaMaz! In the nearly two years we have lived in Mazatlán, I’ve become accustomed to seeing political candidates’ names and faces everywhere—posters, billboards, t-shirts, bumper stickers. 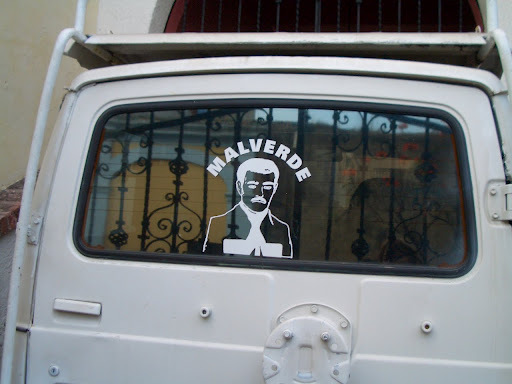 So, quite innocently some months ago, I asked a local friend who this “Malverde” is that I keep seeing in decals on trucks and in windows of homes. Was he a new candidate for city council, or someone to give the mayor a run for his money? “He’s the patron saint of the drug lords,” was the response I heard. What??? Drug lords have a patron saint? And people driving around town are stupid enough to advertise their patron saint on their trucks and in the windows of their homes??!! Isn’t that a bit of an obvious clue for police? Huh??!! As in, the Catholic church sainted the guy? No, of course not, but some people worship him as if he had been canonized. Robin Hood? I know that in many of the poor mountain areas of Mexico, drug lords are seen as the protectors of the local population; they do good deeds, support widows and families, pay teachers or doctors and are, in turn, protected by their communities. It’s part of what makes fighting the drug war so difficult. In doing a bit of research, I learned that Jesús Malverde, the “narco saint” or “angel of the poor,” is known as the Rey Guey de Sinaloa. Meaning, he originates from my home state! There is no evidence proving he actually existed, though word on the street says he was a bandit who was born in 1870 and died May 3, 1909 (May 3 is his “saint’s day”). Some versions of the legend say that Sinaloan Governor Francisco Cañedo, a good friend of Porfirio Díaz, had put a bounty on Malverde. 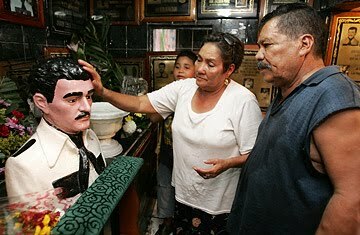 The first shrine to Malverde is in Culiacán, our state capital, and it is in that chapel, legend says, that his bones are buried. 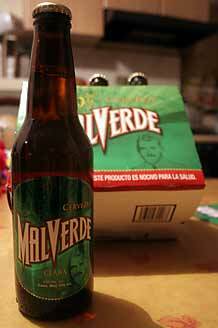 Jesús Malverde is seen as the patron saint of lost causes, similar to Saint Judas Tadeo or the Sacred Heart. Quite a few miracles, including lives saved, have been attributed to him. While originally revered by those involved in illicit activities, particularly drug trafficking, today prayers to Malverde are said by those who are poor, imprisoned, sick, or hungry, and by illegal immigrants. It is said that if you give your problems to Malverde, they will be resolved. He is said to be particularly popular among women without means, those who have been abandoned or widowed, pregnant or with children but no income. Thus, today, he’s much more than the patron saint of the drug lords; he’s a patron saint for a society in crisis. Malverde has various shrines along the drug routes from Cali, Colombia through Mexico (DF, Sinaloa, Chihuahua, Sonora…) and into California, USA. He has three movies to his credit, quite a few narcocorridos (songs) dedicated to him, various prayers or novenas, at least one novel, a stage play, and even a beer that’s named in his honor! You can buy scapularies, decals, stickers, candles, busts and statues…all sorts of products with the Malverde image. I guess it’s just me that had never heard of him. The police in Mexico have a museum on narcotrafficking, that they use to train officers. This is a link to an article in the Noroeste newspaper. And finally, here is a link to an insightful article on the Mexican drug war. A new movie about Malverde is currently filming in Álamos, Sonora. Titled Yerba Mala, it is being made by Corazón Films. Quite a few politicians and government agencies in Mexico have attempted to ban, and have urged musicians to stop making narcocorridos, recognizing that these songs lead to the romanticization of a destructive culture. Malverde, Patron Saint of the Drug Lords | ¡VidaMaz! <Loved it! I’m glad you enjoyed it. I do think it’s rather strange no one ever writes about this topic. It is such a huge part of the culture of this country. Not a lot of academic studies on it, either, from what I can find.